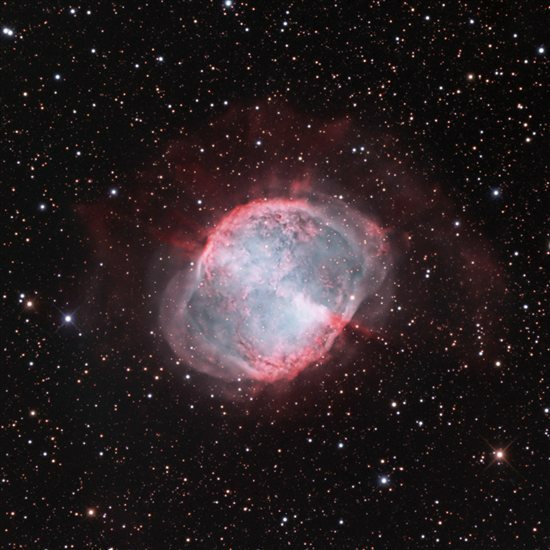 Astronomy magazine is teaming up with LightBuckets Online Telescopes to bring the best images from amateur astronomers around the world to Astronomy.com. LightBuckets, located under the dark and steady skies of Rodeo, New Mexico, features a 24-inch RC Optical Systems Ritchey-Chrétien telescope on an equatorial fork mount plus two other high-quality instruments users can control from any computer. All three scopes feature ultra-sensitive megapixel CCD cameras from Apogee, and each offers a wide variety of Astrodon filters. Starting today, Astronomy.com will feature the terrific images that LightBuckets customers acquire, like the one at right taken by Jase Jennings. But what if you miss one? Not to worry. We also will archive them in their own section of our popular Online Reader Gallery. That’s part one. Plans are already underway for part two — real-time images of the Sun. Steve Cullen, president of LightBuckets, has assembled a team of partners, each of which has donated a specialized type of equipment to make the Astronomy/LightBuckets Online Solar Observatory a reality. Lunt Solar Systems of Tucson, Arizona, has provided the key instrument: a 4-inch Hydrogen-alpha solar telescope. This scope features a special filter that transmits only a tiny fraction of the Sun’s light to an attached camera — but oh, what amazing information that light conveys. Website visitors will see the Sun’s colorful surface, prominences that arch gracefully above its edge, and flares — the largest explosions in the solar system. Together, these companies will help make the Astronomy/LightBuckets Online Solar Observatory an Internet destination you’ll return to again and again. And just as with LightBuckets’ deep-sky images, we’ll set up a solar-image archive in the Reader Photo Gallery. Look for the big announcement soon! Check out the LightBuckets Online Telescopes gallery today!